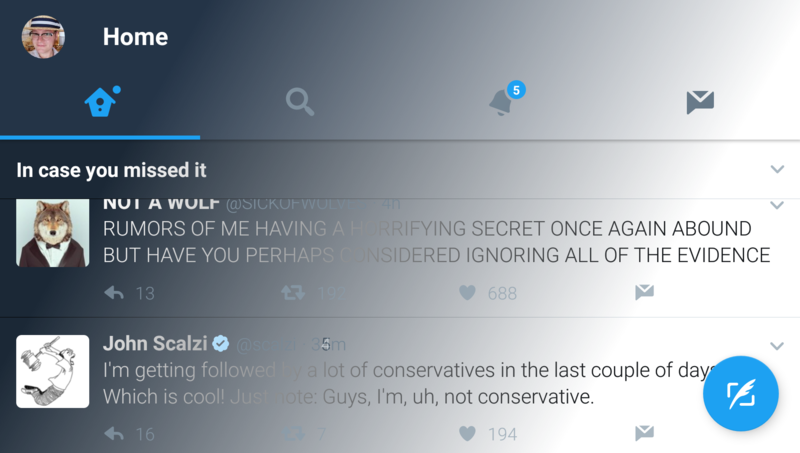 The first-party Twitter client now has another great feature under its belt. Now you can set the app to transition between the standard white theme and the blue night mode theme automatically, based on the time of day. So if you're tired of having to manually flip between each to prevent sudden night-time blindness during an innocent midnight tweet, you can now rest easy knowing your eyes will be safe, if not from the ravages of Twitter, then at least from bright lights. The cycle of development for automatic night mode has been a long one. Hearken back to ancient days of 2016, and you may even remember when Twitter introduced night mode in the beta releases sometime around May. Two months later, at the end of July, Twitter made it an official feature and rolled it out to all the stable releases. 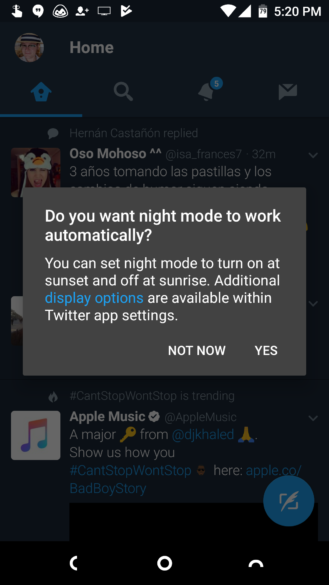 Just earlier this year we heard the same rumblings of an automatic night mode being present in the beta. And now things have come full circle again, as automatic night mode is now a standard feature on the Android Twitter client. The most recent changelog on Google Play makes no mention of automatic night mode, but we've tested the stable client ourselves and found the new feature to be present. Now when you enable night mode, you'll be automatically prompted to set it to turn on and off automatically. The feature can also be enabled and disabled in Settings and privacy -> Display and sound -> Night mode. There you can set it to one of three modes, on, off, or automatic at sunset. Users of AMOLED devices may still lament that the night mode isn't a black theme, but a dark blue-gray is better than nothing. If you are excited to give the new automatic night mode a try, it should be part of the current version listed over at Google Play. You can also pull it down over at APK Mirror if that's more your style.